Do you have a plan for when zombies attack? Editor's note: Aaron Sagers is a New York-based entertainment writer and nationally syndicated pop-culture columnist. He has specialty knowledge in "paranormal pop culture," has lectured at conventions across the country on the topic and is a media pundit on supernatural entertainment. He covers pop culture daily at ParanormalPopCulture.com and can be found on Twitter @aaronsagers. Probably not. If you have to ask yourself that question, or took a moment before answering, then definitely not. In the time it took you to hesitate, even the slowest zombie could pull a dine and dash – or shamble – on you. On the upside, you’re in luck since most people haven’t made the adequate preparations for Z-day. Here’s the deal: A zombie can be a member of the walking dead or a barely living victim from a curse, virus, etc., and alternately run or shamble. They can be the creation of stupid humans, angry gods, black magic, mad science, cosmic events or – as is most often the case – comic book/sci-fi/horror nerds. But whatever their origin, they are a problem that must be dealt with. But not even the Centers for Disease Control and Prevention thinks the masses are ready for the onslaught of the undead. “There are insufficient people prepared for emergencies in the United States,” said Rear Adm. Ali S. Khan of the CDC. A multi-credentialed doctor, assistant surgeon general and director of the CDC’s Office of Public Health Preparedness and Response, Khan was behind the zombie preparedness guide the organization published online May 2011. Inspired by zombie-related social media buzz after the Fukushima Daichii nuclear disaster in Japan last March, and released days before Harold Camping’s predicted rapture, the preparedness guide is a tongue-in-cheek plan. Its message boils down to the idea that if you’re ready for a zombie apocalypse, you’re ready for any more likely crisis or disaster. The CDC website received 2 million page views the first week as a result, and the guide went viral. Apparently, according to TV Land, another tip to survive the zombie apocalypse is to not work at the CDC, which may have been the last hope for humanity in “The Walking Dead,” and went kablooey in a giant explosion at the end of Season One. Khan reminded us, however, that the real deal is “alive and well” and that even in any scenario where the CDC would be blown up, they would have “contingency plans” to make sure they’re still addressing public health – which might be a subtle way of suggesting the government agency has a way cooler underground bunker than we originally thought. Still, being prepared for a zombie uprising isn’t the same as surviving, and thriving, in one. Author Max Brooks is the father of zombie survival after he literally wrote the book on it in 2003. Set against recorded attacks throughout history, “The Zombie Survival Guide” gives practical tips on defensive and offensive strategies against the ghouls whether you’re at home, in a public space, on the move or living in an overrun world. Brooks goes a step further than the CDC (which he toured in October) and gives an extensive breakdown of weapons and combat techniques for life among the dead, but he still equates a zombie apocalypse to a natural disaster or - more likely, he said - a viral outbreak. Also the author of “World War Z” - the book about a global undead pandemic which will be released as a film starring Brad Pitt in December - Brooks gives zombie self-defense lectures that he said remain packed with a diverse crowd of teenagers, middle-aged housewives and other hopeful survivors. As an esteemed member of the advisory board of the Zombie Research Society, (alongside director George A. Romero) Scott Kenemore (author of “The Art of Zombie Warfare”), describes members of the zombie survivalist subculture as "super Boy Scouts" who will be armed head-to-toe and skilled at hunting, fishing and camping. If you haven’t been training since 1968 when “Night of The Living Dead” debuted, or since 2003 when Brooks released his book, there’s no need to panic – even if your name is Barbra and they are indeed coming to get you. 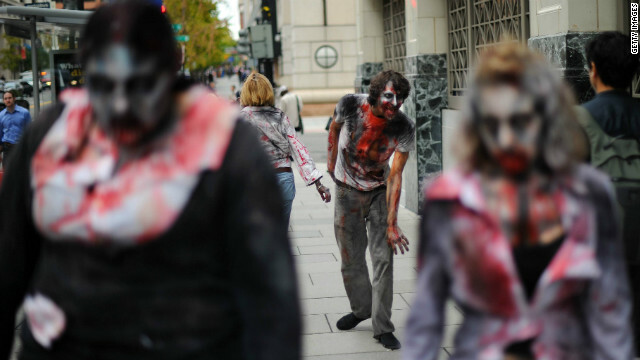 For about $100 and a plane ticket to England, you can attend Wish.co.uk’s Zombie Boot Camp in Droitwich, Worchestershire, for training with military instructors. Utilizing body armor and weaponry, you learn battle tactics and unarmed combat and sniper skills as you train for an attack on a zombie den. Tea, coffee and light snacks are available for nonzombies to eat during training. A little closer to home for American survivors-to-be is the Run For Your Lives “zombie infested 5k obstacle course race,” which advertised on “The Walking Dead” midseason premiere February 12. After launching in Baltimore last October, RFYL is hosting races across the country, with the first of 2012 taking place on March 3 in Atlanta. The American Red Cross and CDC will be present at the race, as will IronE [sic] Singleton (“T-Dog”) from “The Walking Dead.” And Dr. Khan from the CDC will also be running. He said he plans to stay with a large group of buffers. But really, to survive zombies is to understand zombies. Education is key, and learning the difference between an enchanted Voodoo zombie and flesh-eating monster could be tough for newbies not already prepped. So at the end of the day, or at the end of human existence as we know it, if you’re unprepared for the zombie apocalypse, it’s your own fleshy fault. There are resources to build muscles and train your tasty brain for when corpses come back to life. THE KING OF SPAIN ARE BUYNG VENEZUELANS TO STUDIES IN CERN. I'm not certain where you're getting your info, but good topic. I must spend some time finding out much more or figuring out more. Thanks for great information I used to be in search of this information for my mission. Nice post. I used to be checking constantly this blog and I'm inspired! Extremely helpful info specifically the remaining phase 🙂 I deal with such information much. I used to be seeking this certain information for a very lengthy time. Thank you and good luck. Wow! This can be one particular of the most useful blogs We've ever arrive across on this subject. Basically Fantastic. I'm also a specialist in this topic therefore I can understand your hard work. Thanks for the good writeup. It in reality was once a leisure account it. Look complex to more introduced agreeable from you! By the way, how can we be in contact?